I know I always get pretty excited about the projects on here but, seriously, this is one of my favorites! 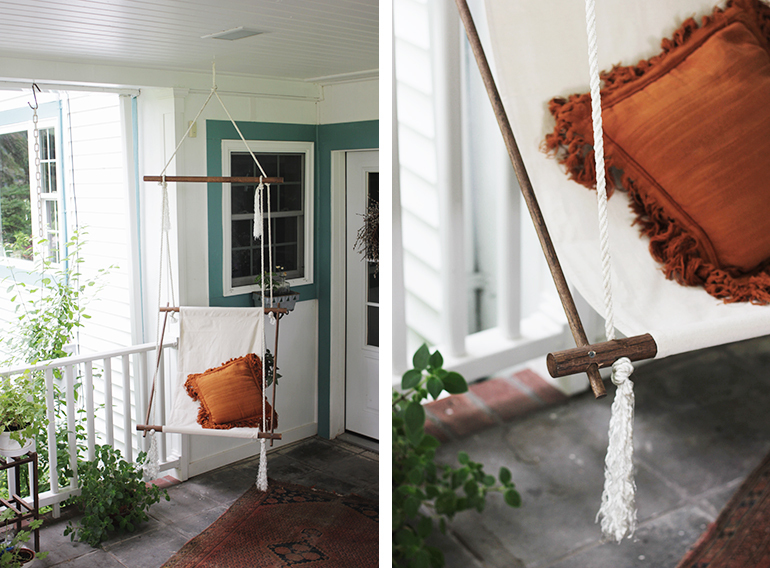 I’ve had a hanging chair on my to-make list for months and there are so many gorgeous ones out there but this one just killed me! I decided to make a super basic version inspired by it. Besides drilling a few non-straight holes, (darn round dowels!) it wasn’t too difficult to make. 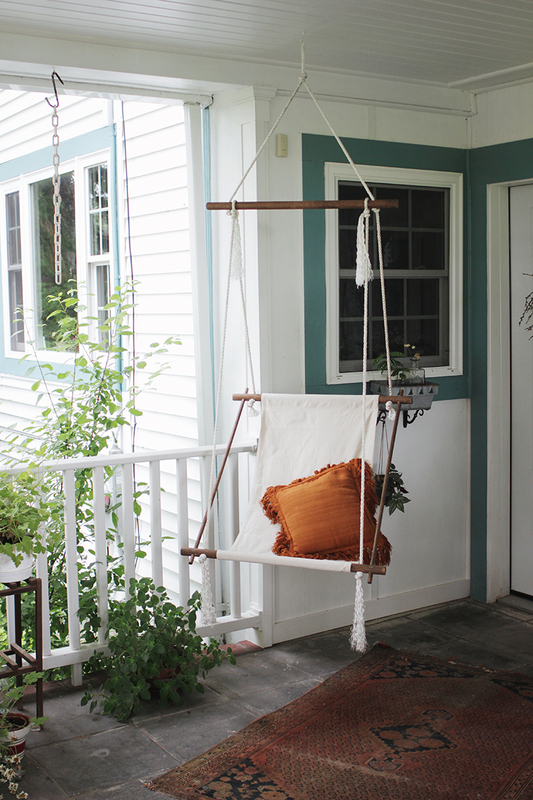 It’s the perfect seat for some summer lounging, magazine reading, and lemonade sipping. It’s sure to get lots of use around here! -On the two 1.25″ dowels for the seat part of the swing, measure 2″ and 3.5″ in from each end and make a mark at each spot. It is very important to keep your dowel still while measuring and make sure the marks are all level, if they aren’t, you won’t be able to slide the 5/8″ dowels through each of the dowels. If you have a dowel jig around, this will be much easier! -Drill 5/8″ holes through the 2″ marks on each of the dowels. Then drill 1/2″ holes through the 3.5″ marks. -On the third 1.25″ dowel measure out and drill only the 3.5″ holes. 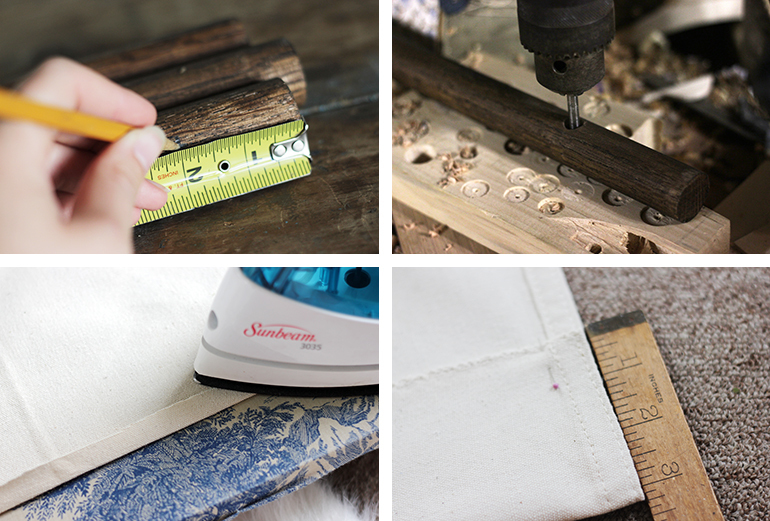 -Along the long sides, fold in 1/2″ of fabric and iron in place. Then fold again and iron. Repeat for other side. -Straight stitch twice along both of these folds. -Fold the top and bottom down 3 1/8″ and straight stitch across the bottom of the fold. -Slide the 1.25″ dowels (with 4 holes) through each end of the canvas seat then put the 5/8″ dowels into the holes drilled for them. -Once in place, drill a pilot hole where the dowels comes together and then screw them together. Make sure the screw isn’t too long that it comes through the other side. 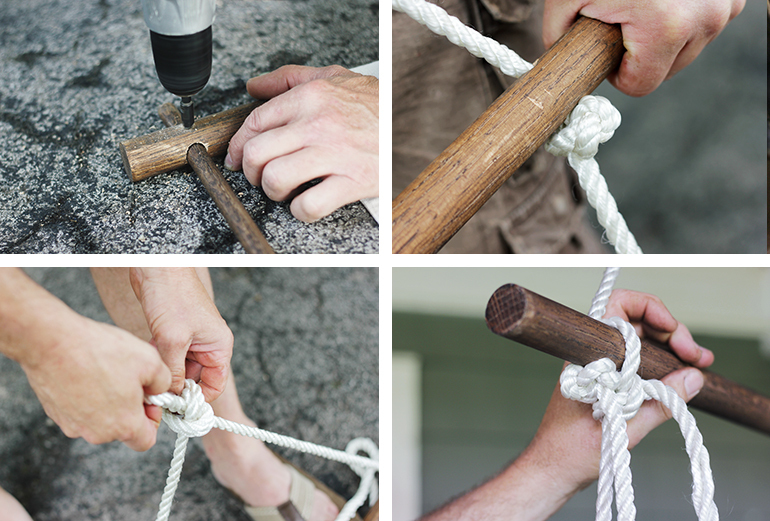 -Tie a double knot in your rope leaving about 4′ on one side of the knot. Feed the other (long) side up through the other 1.25″ dowel. And then feed that rope down through the hole on the other end. -Tie a loop into the rope. Measure to make sure it is directly above the center of the dowel. 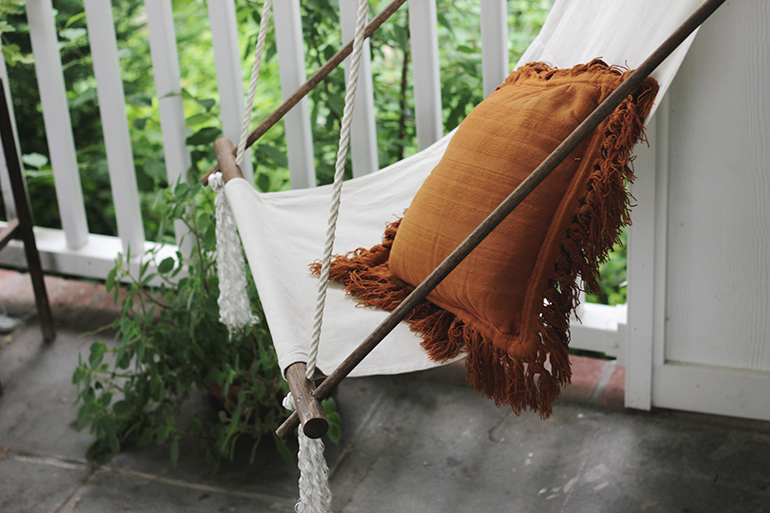 -Feed both ends of the rope down through the top rung of the seat (measure to make sure they are the distance from the top dowel) and tie a knot below the dowel. Trim excess rope. -Take the leftover rope and cut two equal pieces. 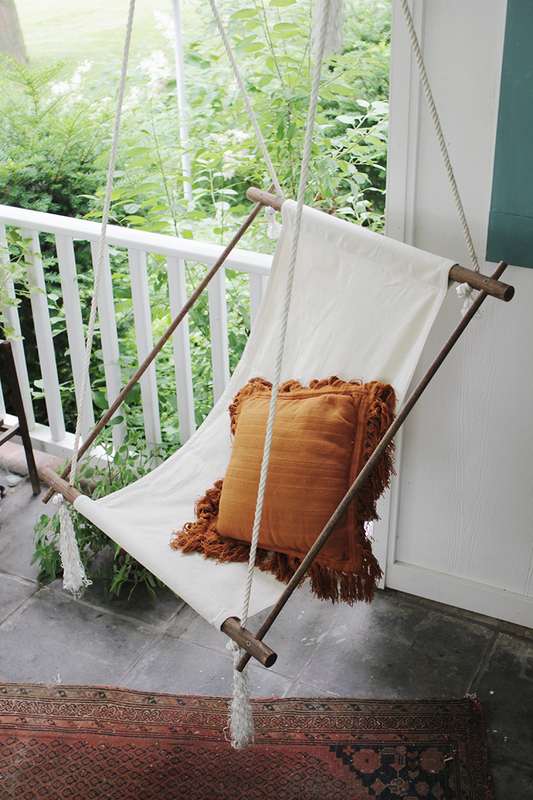 -Make a knot in one end of both ropes (leave 6-8″ hanging down) and feed up through the bottom rung of the seat. -You will bring these ropes up to the top dowel and tie them around the dowel just inside of the rope from the upper rung. I would recommend hanging the swing at the point so it’s easier to make sure it’s level when you’re tying them in place. -Use your hands to fray the ends. -Hang on a hook that supports at least 300 lbs. If you’ve got a lot of crazy boys jumping on it or aren’t quite confident in your crafting skills, just buy one! I’m doing some cleaning and reorganizing in my apartment and I think this beauty might end up in my living room! We are doing a homemade Christmas this year and think I’d like to do this. Do you happen to remember the size screws you used in this project? And while you said the 5/8″ dowels were 36-inches is that true for the 3-1.25-inch dowels as well? Thank you. I am not very handy at all. Do you make and sell these? 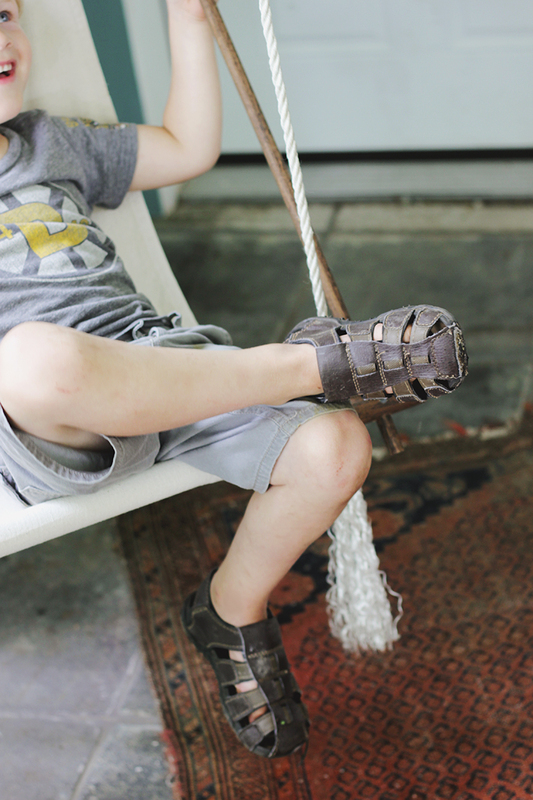 I am looking for a hanging chair for my son’s bedroom. I would love one exactly the same except the canvas in charcoal grey. If you sell, can you let me know how much they cost? There should be framing under the vinyl and you will need to make sure that the hook goes directly into the framing. Not sure exactly how this would work with a vinyl ceiling – you can push up on it to see if you could find the framing, but if there’s plywood underneath the vinyl it might be harder to figure out. You could try using a stud finder but this doesn’t always work either! Hope that helps a little bit!